Hitec’s impressive radio line continues to grow with the Flash 8! Complementing the success of our popular Flash 7, this latest radio delivers commanding reliability through its expanded performance features and outstanding quick response. Our built-in AFHSS technology provides ultra-low latency, precise 4096 resolution and Secure Link compatibility. Store up to 30 models, enjoy full telemetric functions and customize your flights with extensive programming options. 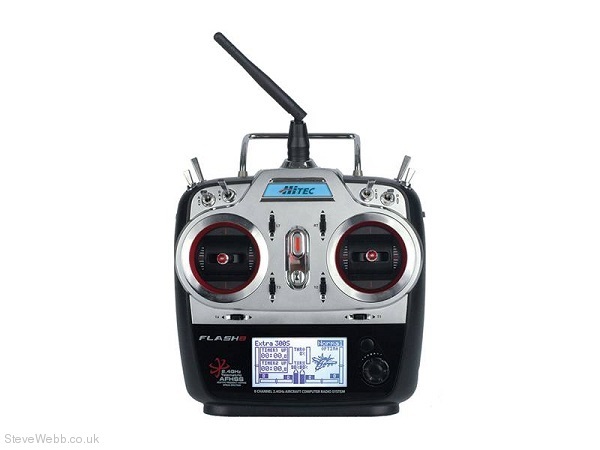 Expand your flying experience today with the Flash 8! Generation 2 AFHSS / SLT flexibility. Fast 7ms frame rate with Maxima receivers. Acro / Glider / Helicopter programming. Five 3-position and two 2-position switches. Digital push button power switch. Intuitive push-button / jog dial programming interface. DCS port (power out) to power VR goggles or head tracking units. 1 x Flash 8 Tx with 1400mAh LiFe battery. 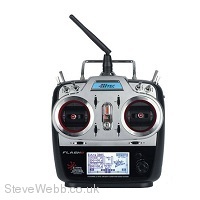 1 x Optima 9 telemetry enabled receiver. 1 x Heavy duty switch harness. 1 x AC / DC charging adapter. 1 x Hitec decal sheet. 1 x BODA antenna holder. 1 x Foam receiver wrap.